Birth Date: March 31, 2016 PMY 822D Red SSS N.K. 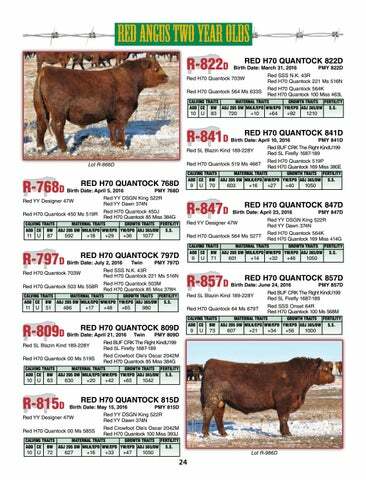 43R Red H70 Quantock 703W Red H70 Quantock 221 Ms 516N Red H70 Quantock 564K Red H70 Quantock 564 Ms 633S Red H70 Quantock 100 Miss 463L calving traits	maternal traits	growth traits	Fertility aod	ce	bw	adj 205 Dw	Milk/epd	ww/EPD	yw/epd	ADJ 365/Dw	S.S. Birth Date: April 5, 2016 PMY 768D Red YY DSGN King 522R Red YY Designer 47W Red YY Dawn 374N Red H70 Quantock 450J Red H70 Quantock 450 Ms 519R Red H70 Quantock 85 Miss 384G calving traits	maternal traits	growth traits	Fertility aod	ce	bw	adj 205 Dw	Milk/epd	ww/EPD	yw/epd	ADJ 365/Dw	S.S.